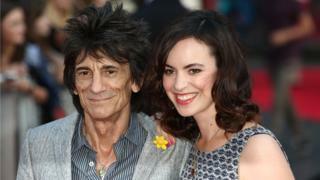 Rolling Stones guitarist Ronnie Wood has become a father again at the age of 68. His wife Sally, who is 38, gave birth to twin girls late on Monday evening, Wood's publicist confirmed. A statement said: "Ronnie & Sally Wood are delighted to announce the birth of their twins Gracie Jane (6lb) & Alice Rose (5.7lb). "The girls arrived on 30 May at 22:30 and all are doing brilliantly. The babies are perfect." The twins are Wood's fifth and sixth children, but the first for him and his wife, who is a theatre producer. Wood has four children already - Jesse Wood with his first wife, former model Krissy Wood, daughter Leah and son Tyrone from his second marriage to Jo, and Jamie - Jo's son from a previous marriage whom Wood adopted. The musician dated Sally Humphreys, as she was then known, for six months before they got married at London's Dorchester Hotel, with Rod Stewart as Wood's best man, in 2012. The couple first met while she was working at the Theatre Royal in Drury Lane, where Wood was displaying some of his artwork.